Thermal ecology studies of ectothermic organisms provide important information for studying ecological physiology, evolution, behavior, and more recently, to assess how climate change may affect them. Ectotherms have received wide attention, but field studies on amphibians are lacking. Consequently, we present data on thermoregulation of 11 species of amphibians from Nayarit, western Mexico. The results are discussed with thermally similar strategies. Our results fill some existing knowledge gaps of amphibian thermal ecology and provide the framework for future research on the eco-physiology of ectotherms. Los estudios de ecología térmica de organismos ectotermos proveen información importante para entender aspectos de su fisiología ecológica, evolución, conducta y recientemente para explorar los efectos del cambio climático sobre ellos. Los ectotermos han recibido notable atención; no así los anfibios. En este trabajo se presentan datos de la termorregulación de 11 especies de anfibios en Nayarit, occidente de México. Se discuten los resultados en función de similitudes térmicas. Los resultados llenan algunos vacíos de información sobre la ecología térmica de anfibios y proveen un marco referencial para investigaciones futuras sobre ecofisiología de ectotermos. Recently there has been growing interest in understanding how ectothermic animals respond to temperature variation, which affects physiological function and influences the behavioral and ecological performance (Navas et al., 2013). Therefore, the study of thermal biology has become an important aspect to provide critical baseline information about the species’ eco-physiology (Huey, 1982). This is a key step in predicting the consequences and generating precise models of invasive species (Kearney et al., 2008), infectious diseases (Blaustein et al., 2012), species richness (Buckley & Jetz, 2007), and climate change (Sinervo et al., 2010). In this sense, within vertebrates, reptiles have received the most attention from thermobiologists mainly diurnal lizards and many groups of snakes (Huey, 1982). However, thermoregulation studies in the field on amphibians have been behind and are widely dispersed (Brattstrom, 1979). For example, all field body temperatures recorded for amphibians were documented in only a few species (e.g., Brattstrom, 1963, 1979; Navas & Araujo, 2000; Raske et al., 2012) or assembly communities (Navas, 1999; Navas et al., 2013). Amphibians are especially sensitive to specific humidity and environment thermal ranges, which are key variables in their natural history (Wells, 2010). For this reason, amphibians are more vulnerable to environmental changes than other animals, making them important indicators of environmental threats. Therefore, the aim of this note is to provide baseline information about the thermal biology of amphibians in the wetlands of Nayarit, western Mexico. Specifically, we investigate: 1) the range of body temperatures at which individuals are active in the field, and 2) the relation of microhabitat temperature (air and substrate temperatures) on body temperature. Our results will serve to fill some of the knowledge gaps of amphibians’ thermal ecology and to assist with future research on ectotherm behavior, evolution, and eco-physiology. This study was performed at 2 sites in the state of Nayarit, Mexico. The first site is the urban wetlands, located southwest of Tepic City (designated Tepic; 21.48° N, -104.85° W; 920 m elev.). These small (1/2 ha) wetlands are immersed in an urban area that is being developed but still contains small fragments of secondary vegetation. The climate of the region is characterized by rain in the summer with a mean annual temperature ranging 20.9-21.7 ºC, with May being the hottest month (33 ºC mean temperature) and January the coolest (mean 10.3 ºC) (García, 1973). In Tepic City, the total annual precipitation is 1,003 to 1,348 mm with a daily maximum of 61.3 mm. The second site is a rural community (designated El Cuarenteño; 21.45° N, -105.03° W; 950 m elev.). This site is located west of Tepic City (15 km in straight line) but physically separated by the Sierra de San Juan that reaches 2,200 m elev. The climate is warm and sub humid with rains in the summer and an annual mean temperature of 16-26 ºC. Total annual precipitation ranges 1,200-2,000 mm. The vegetation in this study site consists of coffee plantations immersed in a matrix of tropical deciduous forest with patches of cloud forest. The species of amphibians studied in this work are shown in table 1. All these species represent 30% of the amphibians of Nayarit (Woolrich-Piña et al., 2016) and they occur in similar environmental conditions (Luja et al., 2014); however, there are differences in species composition between the 2 study sites (Table 1). Field body active temperature (Tb), substrate temperature (Ts) and air temperature (Ta). n = sample size. Body size = adult body size (SVL; mm) considered in this study. Showing mean ± standard deviation and in parenthesis minimum-maximum in ºC. Tb range = amplitude of body temperature (Tb maximum-Tb minimum) in ºC. Strategies: CD = conduction (based on substrate); CV = convection (based on air); ST = stenothermic (narrow range), and ET = eurythermic (wide range). Location: * = Tepic, ** = El Cuarenteño, and *** = both sites. Fieldwork was conducted every week from June to October of 2013 and 2015 (20 days of effective work per year = 4 days per month in each locality). We searched for amphibians between 18:30 and 00:30 h. We justify this period as potential activity based on the life history, previous observations during fieldwork, and literature (Wells, 2010). We collected 203 individuals and measured their Tb with an infrared (IR) thermometer (Carson; ± 0.1 °C). We placed the IR thermometer close to the animal (≤ 10-20 cm distance to increase the accuracy) to record the amphibians’ temperature (Navas & Araujo, 2000). Immediately, we took the substrate temperature (Ts) with the same IR thermometer and air temperature (Ta; 3 cm over the substrate) was recorded with a digital thermometer (Beurer, HM16 ± 0.1 °C). Both temperatures were taken where amphibians were first observed. We also recorded time of capture and snout-vent length (SVL; mm). Amphibians were not marked in the field, so we cannot determine possible recaptures. Finally, all amphibians were released at their capture sites. Only Tb’s from adult amphibians were analyzed. Data were excluded if temperature measurements were taken more than 21 s after first sighting the frog in the field. We performed multiple regressions to evaluate the relationships among Ta, Ts, and Tb. We used SigmaPlot version 10 (Systat Software, San Jose, CA) for statistical analyses and graphing. Figures and tables in the text show mean ± standard error ( ± SE), (n) sample size, and temperature range. We recorded the field active body temperature of 194 individuals belonging to 11 species. The body temperature averages of the amphibians measured in the field are shown in table 1. In figure 1, we show the activity body temperature by species. In figure 2, the distribution of field body temperatures is shown. The species with the lowest minimum activity Tb values were Tlalocohyla smithii (14.5 ºC), Plectrohyla bistincta (15.1 ºC), and Agalychnis dacnicolor (17.2 ºC), but in general, the rest of the species start their activity ~20 ºC. On the other hand, the species with the maximum temperature values observed was Leptodactylus melanonotus (33.3 ºC; Table 1; Fig. 1). Particularly, the species with the greater temperature range was P. bistincta (15.1-29 ºC), A. dacnicolor (17.2-29.8 ºC), L. melanonotus (21.5-33.3 ºC), and T. smithii (14.5-25.7 ºC). The species with the lesser temperature amplitude were Lithobates catesbeianus (23.4-25.8 ºC), and Smilisca fodiens (21.4-24 ºC; Table 1). In general, this community of amphibians maintains an average of Tb of 22.6 ± 2.49 ºC, and the range of activity was from 19.5 to 28.3 (the central 80% of all body temperatures). The majority of the species were active when Ta ranges from 19.1 to 27.7 ºC (22.3 ± 2.55 ºC); and when Ts was from 21.3 to 29.4 (24.6 ± 2.71 ºC). The degree of correlation between Tb and microhabitat temperatures for each species is shown in figure 3. In general, we observed, in most of the species, a positive and significant correlation coefficient between Tb and the temperature of the microhabitat. However, 2 species (L. catesbeianus and Smilisca baudinii) had a negative and non-significant relation neither Ta nor Ts. A visual comparison of the scatter diagrams and correlation coefficients seems to show a higher degree of correlation between Tb and Ts and the correlation between Tb and Ta of 7 species was not statistically significant. In nearly every case the Ta was higher than either the Ts or the Tb (Table 1). Figure 1. Activity body temperature (Tb) of amphibians. Species: 1. Agalychnis dacnicolor; 2. Craugastor occidentalis; 3. Hyla eximia; 4. Incilius mazatlanensis; 5. Leptodactylus melanonotus; 6. Lithobates catesbeianus; 7. Lithobates forreri; 8. Plectrohyla bistincta; 9. Smilisca baudinii; 10. Smilisca fodiens, and 11. Tlalocohyla smithii. The median is indicated by the horizontal line within the box. Literature dealing with thermoregulation in amphibians is limited, however, previous studies on thermal ecology of nocturnal ectotherms have demonstrated that they prefer lower temperatures than most of the diurnal species (Brattstrom, 1963, 1979) and these lower temperatures can be achieved with low effort when the environment offers optimal temperatures (Huey & Slatkin, 1976). In this study, most of the species tend to be highly thigmothermic having at least the ventral surface of their bodies tightly pressed to the substrate, thereby applying more of their surface area to the substrate. According to Huey (1982), this strategy indicates that conduction from the substrate has a larger part in maintaining and regulating body temperature in amphibians than air temperature. Field-active Tb’s of amphibians indicates a pattern of low variability in thermal biology among amphibians (Fig. 2). This suggests that these species may exhibit similar patterns of thermoregulatory behaviors. For example, in general the Tb ranged from 15 to 30 °C (~15 °C; Table 1 to see each species). The data describe only the limits and possible preferences of different species of amphibians in the field, because in the field we surveyed for emergence, and then recorded the Tb of emerging animals. It should be noted that this study only dealt with field active Tb, and we do not consider preferred body temperatures under laboratory conditions. Data on preferred Tb are actually quite rare, because it requires measurement under standard conditions (Huey, 1982). However, measurements of active Tb are highly correlated with preferred Tb (Huey, 1982; Sinervo et al., 2010). Figure 2. 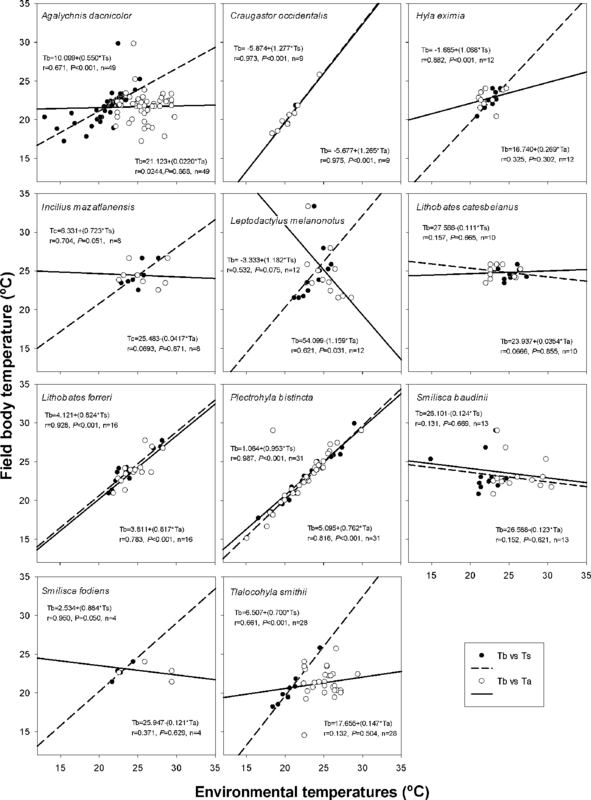 Boxplots and distribution of field body temperatures (A) and microhabitat temperatures (substrate [B] and air [C]) of some amphibian species in Nayarit, Mexico. The median is indicated by the vertical line within the box. The arrow points the average of the temperature. The overall results of this study may be used in future studies as context for a diverse distribution of species (Munguía et al., 2012), resilience of populations to climate change (Ochoa-Ochoa et al., 2012), susceptibility to disease (Blaustein et al., 2012), niche conservatism or evolution, and the parameterization of models (Navas & Araujo, 2000). Finally, this data can be used in species distribution or extinction risk models based on thermal requirements and tolerances, thermal performance, as well as operative environmental temperatures under a mechanistic approach (Navas & Araujo, 2000; Sinervo et al., 2010). In this sense, the use of agar models proposed by Navas and Araujo (2000), which are based on temperature and water relationships, allow to assess: a) the extent to which amphibians take advantage of the thermal environments; b) the range of body temperatures at which individuals are active; c) the implication of microhabitat selection on body temperature; d) the effects of habitat disturbance on the thermal ecology of amphibians, and e) the ability to measure water loss under different conditions. We also recommend more complex analysis including wind speed, humidity, predation risk, or landscape configuration in order to evaluate particularities in thermoregulation. There is not much research on this topic, despite the importance of thermal eco-physiology when crafting conservation efforts aimed at maintaining global amphibian diversity. Therefore, it is clear that more research is needed to test these approaches. Figure 3. Relationship among field body (Tb), air (Ta) and substrate (Ts) temperatures of different amphibian species. Blaustein, A. R., Gervasi, S. S., Johnson, P. T. J., Hoverman, J. T., Belden, L. K., Bradley, P. W. et al. (2012). Ecophysiology meets conservation: understanding the role of disease in amphibian population declines. Philosophical Transactions of the Royal Society of London B: Biological Sciences, 367, 1688–1707. Brattstrom, B. H. (1963). A preliminary review of the thermal requirements of amphibians. Ecology, 44, 238–255. Brattstrom, B. H. (1979). Amphibian temperature regulation studies in the field and laboratory. American Zoologist, 19, 345–356. Buckley, L. B., & Jetz, W. (2007). Environmental and historical constraints on global patterns of amphibian richness. Proceedings of the Royal Society of London B: Biological Sciences, 274, 1167–1173. García, E. (1973). Modificaciones al sistema de clasificación climática de Köppen. México D.F. : Universidad Nacional Autónoma de México, Instituto de Geografía. Huey, R. B. (1982). Temperature, physiology, and ecology of reptiles. In C. Gans, & F. H. Pough (Eds. ), Biology of the Reptilia (pp. 25–91). Academic Press, New York. Huey, R. B., & Slatkin, M. (1976). Cost and benefits of lizard thermoregulation. Quarterly Review of Biology, 51, 363–384. Kearney, M., Phillips, B. L., Tracy, C. R., Christian, K. A., Betts, G., & Porter, W. P. (2008). Modelling species distributions without using species distributions: the cane toad in Australia under current and future climates. Ecography, 31, 423–434. Luja, V. H., Ahumada-Carrillo, I. T., Ponce-Campos, P., & Figueroa-Esquivel, E. (2014). Checklist of amphibians of Nayarit, western Mexico. Check List, 10, 1336–1341. Munguía, M., Rahbek, C., Rangel, T. F., Diniz-Filho, J. A., & Araujo, M. B. (2012). Equilibrium of global amphibian species distributions with climate. Plos One, 7, e34420. Navas, C. A. (1999). Biodiversity of amphibians and reptiles in the paramo: an ecophysiological view. Revista de la Academia Colombiana de Ciencias, 23, 465–474. Navas, C. A., & Araujo, C. (2000). The use of agar models to study amphibian thermal ecology. Journal of Herpetology, 34, 330–334. Navas, C. A., Carvajalino-Fernández, J. M., Saboyá-Acosta, L. P., Rueda-Solano, L. A., & Carvajalino-Fernández, M. A. (2013). The body temperature of active amphibians along a tropical elevation gradient: patterns of mean and variance and inference from environmental data. Functional Ecology, 27, 1145–1154. Ochoa-Ochoa, L. M., Rodríguez, P., Mora, F., Flores-Villela, O., & Whittaker, R. J. (2012). Climate change and amphibian diversity patterns in Mexico. Biological Conservation, 150, 94–102. Raske, M., Lewbart, G. A., Dombrowski, D. S., Hale, P. , Correa, M., & Christian, L. S. (2012). 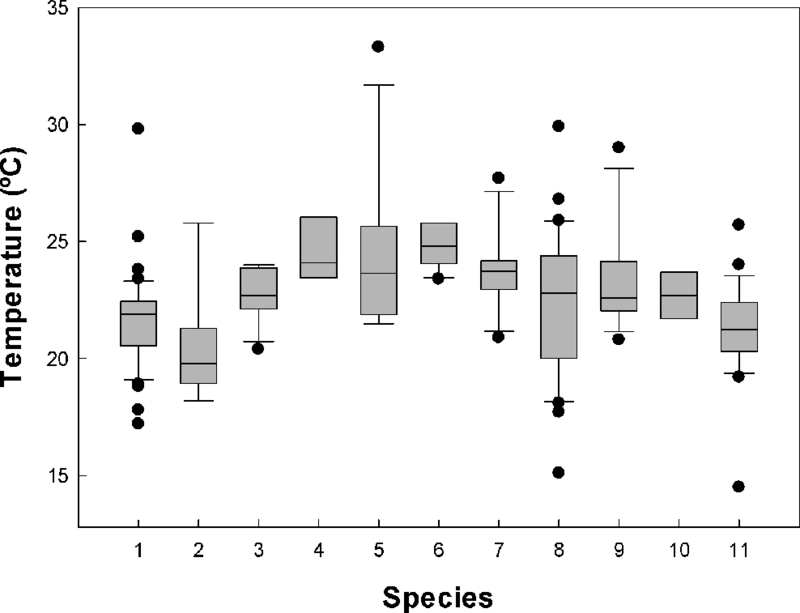 Body temperatures of selected amphibian and reptile species. Journal of Zoo and Wildlife Medicine, 43, 517–521. Sinervo, B., Méndez-de la Cruz, F., Miles, D. B., Heulin, B., Bastiaans, E., Villagrán-SantaCruz, M. et al. (2010). Erosion of lizard diversity by climate change and altered thermal niches. Science, 328, 894–899. Wells, K. D. (2010). The ecology and behavior of amphibians. Chicago: University of Chicago Press. Woolrich-Piña, G., Ponce-Campos, P., Loc-Barragán, J., Ramírez-Silva, J. P., Mata-Silva, V., Johnson, J. D. et al. (2016). The herpetofauna of Nayarit, Mexico: composition, distribution, and conservation status. Mesoamerican Herpetology, 3, 376–448.